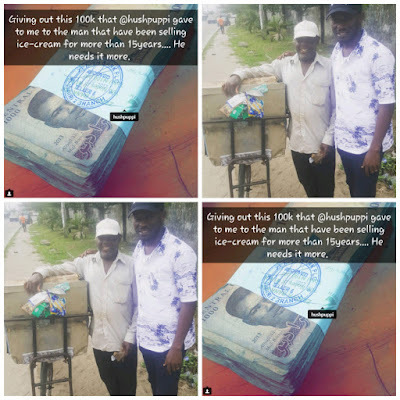 Nigerian comedian, Mr. Jollof took to his Instagram page to call out Nigerian big boy, Hushpuppi for spending N11 Million at a Lagos club when he could have empowered several young guys with the money. "This ice cream man sold ice cream for almost all those that attend Twin fountain college, federal government college, Demonstartion and Don Domingos in the last 15years. He even use to sell credit purchase to those that are credit worthy & i am among that clique 😂😂😂😂😂Yes I always give him money whenever I pass through that area but today I decided to let him feel what is called JOY & HAPPINESS. Thanks to @hushpuppi for making this possible, you gave me the money and it just put smile on someone's face. No beef involved you are my brother and friend and it is my duty to correct you if you do something wrong......."
» Bobriskyattacks Fellow Bleaching Cream "seller"
» Bobrisky Attacks Fellow Bleaching Cream "seller"